It’s like the old adage of the magician…”now you see it…now you don’t“. In this case I’m talking about the transient nature of street art. Major ‘hot spots’ are subject to many slashings and go-overs which means capturing and recording of the ‘here and now’ is important. This piece I have watched for a couple of years. Excited to find it initially and see its almost seamless “run” has been magical. It has survived many a ‘clean-up’ by local Council anti-graffiti mobs who have unsuccessfully tried to remove this whilst removing cheap tags from the same wall, especially when I thought this was going to be a real ‘stayer’. I will admit that I do not know who the stencil artist is. However, after passing by the space where this existed, I had to ‘blow into the proverbial paper bag’, when I realised that new owners of the establishment have painted over the brickwork in white paint, as part of their renovations and this piece has GONE! In one fell swoop – a massacre has occurred. For examples of Street Art terminology see my Street Art page. 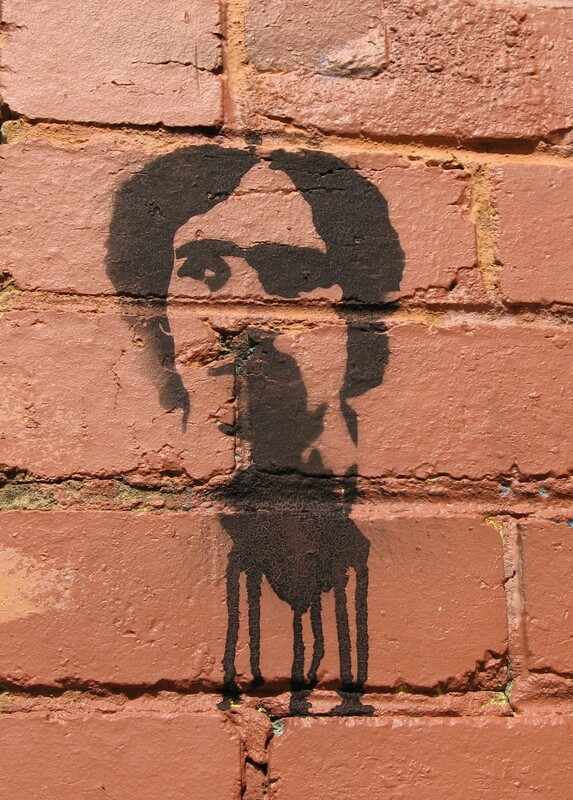 This entry was posted in StreetArt and tagged stencil art, Stencils. Bookmark the permalink.